Known for being one of the world’s ultimate travel destinations, the Southeast Asian country of Vietnam is a landmass full of lovely landscapes, culinary delights like Pho, and various seasonal delights that are a treat to experience any time of the year. Whether you’re traveling by your lonesome or with your best friend, you can’t go wrong exploring this gem of a country. It can be a bit of a challenge to decide exactly when you want to plan your Vietnam trip. So, here is a breakdown of the weather in Vietnam by season and region, which can help you decide which particular part of the country you’d like to venture forth into. If you’re looking for the coolest time to visit the southern metropolis of Ho Chi Minh City, here’s some Vietnam travel advice: it is always hot in Ho Chi Minh City! Even when it’s pouring with rain, it’s still very hot and humid. You have been warned! From December to February, you’ll love the more moderate temperatures of Winter in Vietnam if you like to beat the heat. In the Northwestern region of the country, the dry season begins in October and runs until March, which is a great time to visit Vietnam. The average temperature in this nook of the country is around seventy degrees Fahrenheit. If you’re on the search for dry and cool weather, check out the regions south of Ho Chi Minh City, particularly around the Mekong Delta. The South normally experiences “dry” Summers of an average 78-degrees Fahrenheit. 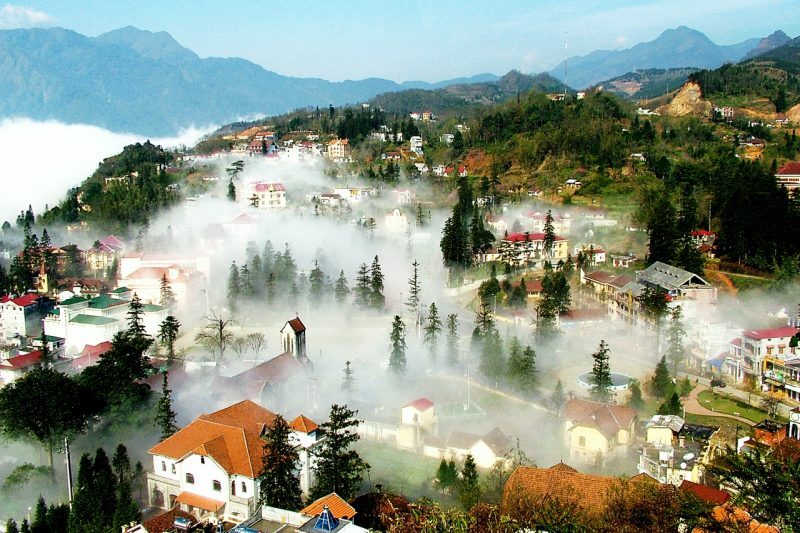 For those of you wondering when to travel to Sapa, Vietnam, know that it’s not uncommon to see snow there in December and January. So, if you prefer the warmer months, you might want to schedule your trip to that part of the country outside of that time-frame. A note on winter Vietnam weather, January might be cold in the north, but it’s likely to be warm in the south. In general, anywhere from October to March is a great time to visit Vietnam to do hiking or outdoor activities that require agreeable weather. If you want a tropical Winter beach getaway in your life, the best time to visit Phu Quoc island, Vietnam, is in Winter. If you find yourself on the Central coast, you won’t have to worry about much rainfall during the latter half of the Winter months. *Vietnamese New Year, or Tet is one of the biggest celebrations in the country, and is a definite advantage of visiting during this time of year. You’ll see many a firework display, colorful dragon dances, and inspiring musical performances. *An added benefit of visiting Vietnam during the Winter is the Bai Dinh Pagoda Festival that happens during this time of year- it’s South of Hanoi, within the Ninh Binh Province. March and April are the succulent Springtime months in Vietnam, when the weather begins to gently warm up. Spring is warm overall and falls on the drier side in the North, which makes for another great time to visit Vietnam for weather. Near Hanoi, Ninh Binh, and other northern cities, expect temperatures in the sixties with high humidity, and a light drizzle on rare occasion. If you venture to the South, it gets a bit warmer, with temperatures ranging from the seventies to the nineties (in Fahrenheit). Typically, the Springtime skies in Vietnam are clear and full of sunshine; However, it’s never a bad idea to pack a poncho or umbrella for those beloved just-in-case situations. It is indeed a wonderful time to make a trip to the country’s southern islands and flawless coastlines, for the unrivaled mild weather. Perhaps you might want to plan a visit to the sparkling waterfalls of Dalat, or to the Con Dao Archipelago. Springtime is ideal for seeing rice fields in Vietnam- where they glow an iridescent green in the Northern mountains. *A noteworthy festivity worth checking out that domestic and international travelers alike attend in Springtime is the Hoa Ban Festival (Ban Flower), where you’ll see the beautiful ban flower as the backdrop. This flower is said to resemble the human soul, and pure love. 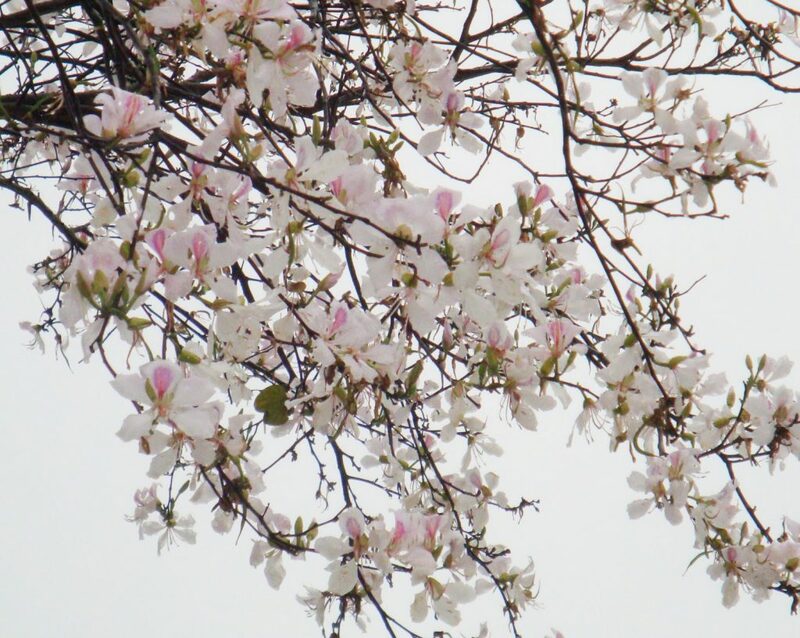 It’s a known fact that Spring has arrived in Vietnam when the mountainous regions of the Northwest suddenly become blanketed with this special flower. The sweet months of Summer in Vietnam range from May to September, where the majority of the country, save the areas in the far North, experiences bright, sunny weather. Summer is the most popular season for travel to Vietnam- so book in advance for that perfect accommodation you’ve had your eyes set on. Prices will tend to be a bit more expensive on the coast but are still very affordable. But hey- this is traditionally the warmest time of year, so what are a few more dollars for a terrific time? 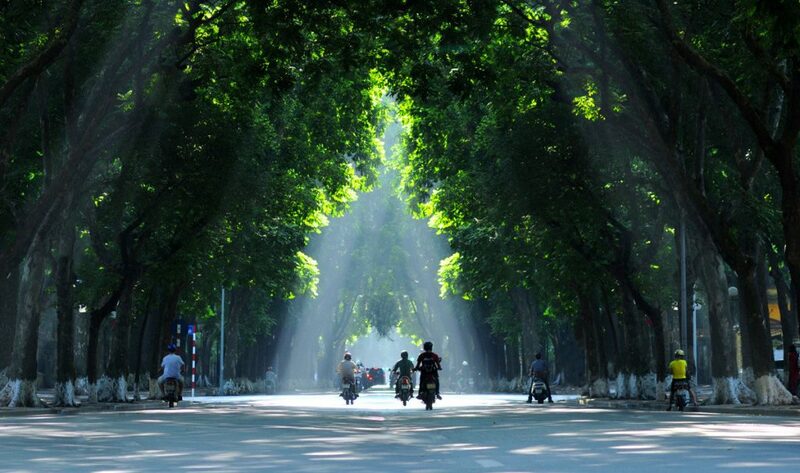 Hanoi and the Northern regions of Vietnam experience temperatures ranging in the upper 80’s (Fahrenheit), and up to 40-degrees Fahrenheit in the Central and Southern areas. 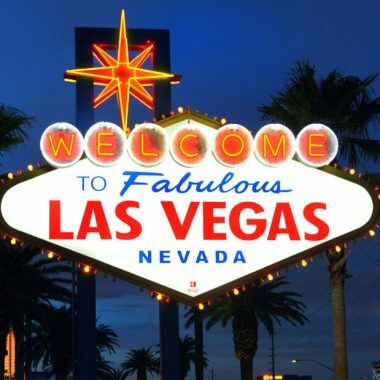 This is typically the hottest season to travel to this geographic point on the globe, and is the best time to tour the country if you love having fun under the sun. The wet season in the southwest of the country runs from April to September, and is warm and wet, as opposed to the northeast monsoon that tends to air more on the drier and cooler side of things. Just because the country is wet in the South at this time of year doesn’t mean it’s not worth a visit- as it can be quite lush and green. The only area to avoid this time of year is the beaches, due to the fierce waters. And, if you’re lucky enough to be here for monsoon season, you won’t have to worry about taking a shower in the morning- just step outside and prepare for the downpour. This can be a godsend on days of 100-degree weather, but it may cause changes in any outdoor plans you may have had. Either way- Que sera, será. Ain’t no rainin’ on this Vietnamese parade! Just remember that most of the country is hot all season long! *The coastal city of Nha Trang is a water-sports hub, featuring a crescent-shaped coastline and rolling hills in the background, with magnificent views. Try going for a swim in the cerulean-blue waters of the bay, where you’ll see small islets peeking out from beneath the waters, and perhaps tourists and locals passing the time windsurfing, parasailing, or flyboarding. October to November are the Autumnal months in Vietnam, where you’ll find a perfect happy medium of both hot and cold temperatures. The ideal temperatures are what classify these months as high tourist season. Known for being the most romantic time of the year, Vietnam has many specialties during the Fall. From the seasonal dracontomelon (an edible fruit) to green young rice (com), to the breathtaking views of the Northern Highlands that become speckled with yellow grain- Fall has it all. If you’re in Hanoi around this point of the year, you’ll find many mild, dry days that average around seventy degrees -cherished temperatures for any activity you might want to do. Autumn is the most pleasant climate of the year in this capital city and for Northern Vietnam in general- so this would be a great time of year to bring the family. Central and South Vietnam both experience a significant amount of rainfall and drizzly days, with temperatures averaging around 30-degrees Celcius. So, the weather isn’t quite as favorable as Hanoi, but traveling through this part of the country would remain a novel experience, nonetheless, during this time of year. *The best time to visit Halong Bay, Vietnam is during this time of year, due to the pleasantly cool and soothingly sunny climate. It’s a UNESCO world heritage site that features hundreds of small islets with stunning views, where you can spend the day rock climbing, scuba diving, or trekking around. Ha Long Bay has actually been recognized as one of the New 7 Wonders of Nature, and shouldn’t be missed! What month is the best time to visit Vietnam? When is the best time of year to visit Vietnam? What about Vietnam seasons? This depends on what region of Vietnam you’d like to visit, although there is truly no best time to visit this wonderful country. Any month is a good month to visit Vietnam. In terms of Vietnam weather, December may be cold in Hanoi but warm in Ho Chi Minh City. If you’re planning on traversing the entire country, Autumn and Spring are overall the most favorable seasons to do so. Otherwise, just mull over the type of weather conditions that would be ideal for you according to the specific area of the country that you’d like to spend your time, and go from there! 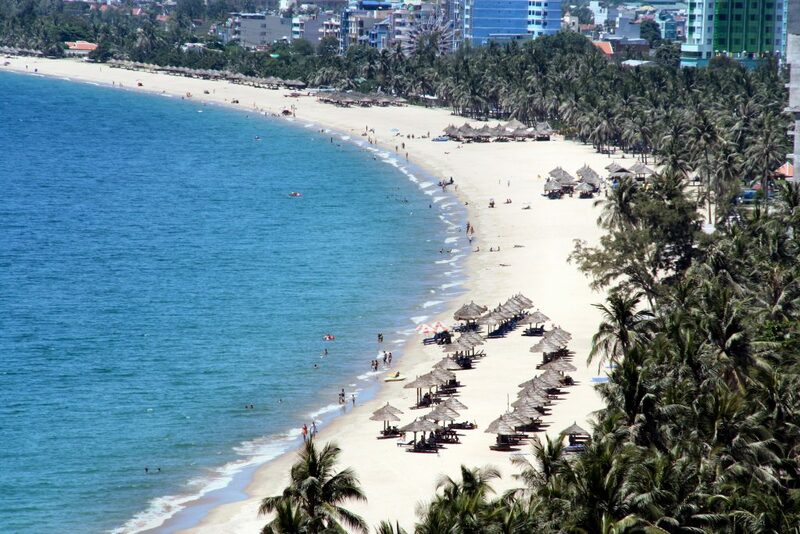 When is the best time of year to visit Vietnam beaches? Ranging from Central to Southern Vietnam and down the East coast, there is a beach for every season in Vietnam. If you find yourself in Central Vietnam, particularly near Danang or Hoi An, the average temperatures will likely be 38 degrees Celsius, or 100 degrees Fahrenheit in the peak of Summer, and much cooler in Winter. The Southern beaches have warm temperatures every month of the year, with highs around 85 degrees Fahrenheit. Note that Nha Trang does experience monsoons from September through January, so it’s a matter of whether or not you want to go and brave them anyway. The oceanside town of Hoi An, the pearl of Central Vietnam, has warm temperatures year-round, with the exception of monsoon season. Hoi An’s dry season ranges from February to July, with an abundance of sunny days and little rainfall. From the months of September to January, rain is common, as it’s the central Vietnam rainy season. The weather in Vietnam, particularly in the central regions, is notoriously unpredictable – so prepare yourself for all eventualities! If you’re lucky enough to be in Hoi An during the Full Moon, get ready for the festivities that happen every month such as singing, dancing, entertaining games, and streets filled with lantern lights. So, if you’re long-term traveling and miss the Full Moon, there’s always another one next month – check with a Vietnam travel guide for the Lunar Calendar dates! In Conclusion: When is the best time to go to Vietnam? By now, you’ve probably realized that Vietnam is a melting pot of micro-climates and at the mercy of unpredictable weather. This is what makes it so unique. From the hardy northern borders to the tropical south, there’s something in Vietnam for every traveler. 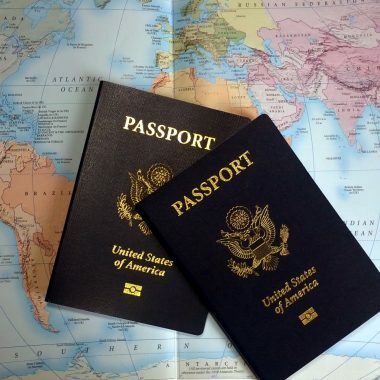 Fortunately, Vietnam has relaxed its visa rules for many nationalities, and its tourism industry is booming. In short: the best time to travel to Vietnam is right now.